Last Friday I explained to readers that my 5 year old nephew and I were traveling together for the first time without one of his parents. I asked you to enter my random drawing for 1,000 AAdvantage Miles and an AAdvantage logo paper clip tin by sharing your best advice traveling with a child. Congratulations Joseph F.!! 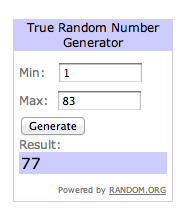 You are the winner of the random drawing. Thanks to everyone for participating and thanks for the helpful tips! After reading all the comments, I decided that my original plan, Angry Birds and an iPad, wasn’t going to be enough. It wouldn’t have been. I’m glad I asked! We ended up taking some books, juice and cheerios, a movie, and crayons. 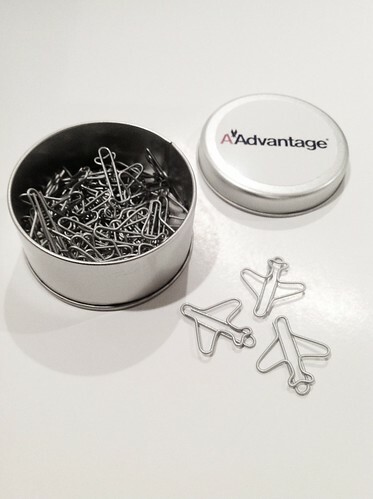 Thanks to American and the AAdvantage Team for providing the miles and the paper clip tin. And again, I want to say thanks for all the good advice. I, and 48 other passengers, appreciate it! It’s Monday, and for many that means it’s back to work. So, the mind quite naturally turns to thoughts of vacation. Third quarter awards are valid for eligible round trip travel originating in the 48 contiguous United States. Booking is valid June 1, 2012 – September 30, 2012 for travel from July 1, 2012 through September 30, 2012*. All travel must be completed by September 30, 2012. Go here to read the full list and complete details. Where did you get the paperclips?! They’re SO cute. @ Amanda – They are cool! The AAdvantage team was nice enough to give them to me to use with the blog. I thought that you might be able to buy some at the C.R. Smith Museum Gift Shop, but didn’t see them listed. You can buy them at Sky Supply. I love these quarterly reduced fares. Throw in the 10% back from my advantage credit card and is a great value for trips I was going to redeem anyway. I had a question come to mind though. I know I can adjust a reward ticket after it has been made. Can I adjust the return date so it proceeds the departing date and essentially reverse the direction of the flight? These seem like great deals but I have a bit of confusion how they work. Are these cities the cities you can fly TO? Or do you have to fly FROM these cities? If these are the destination cities, does it matter where you fly from? And if these are orgin cities, does it matter why you fly to? I’m out in California so I’m not really clear if any of these deals can be used by me. @ Everett The listed cities are destination cities. Your flight must originate from any of the 48 contiguous United States. Also, in order to get the discount it must also be a round-trip ticket in the same fare class. How do I give you my info?